People and politicians in South Africa have been paying tribute to Walter Sisulu, an anti-apartheid hero who died on Monday at the age of 90. Among those who visited Sisulu's family home in Johannesburg were former President Nelson Mandela - a friend of more than 60 years - and President Thabo Mbeki. A state funeral is being planned and flags on all government buildings will fly at half-mast on Wednesday. The BBC's Alastair Leithead in Johannesburg says Sisulu was considered a pillar of the anti-apartheid struggle over five decades. Born in 1912 - the year the African National Congress (ANC) was launched - Sisulu rose to become the organisation's deputy president. 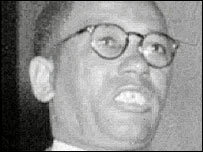 In the early 1940s he recruited Mr Mandela and the two founded the ANC's youth league to press for a more aggressive stance against the apartheid government. They later formed the armed wing of the ANC, Umkhonto we Sizwe. The two spent a quarter-century together at the notorious Robben Island prison, after their conviction for anti-government sabotage in 1964. Looking old and frail, Mr Mandela visited Sisulu's family at their home. He said his friend and mentor was rarely feted by foreign leaders - nor did he receive a Nobel peace prize. "Nevertheless, he stood head and shoulders above all of us. What was the reason for this? Because he had the gift of humility and simplicity," Mr Mandela said. Almost alone among the ANC's leaders, he still lived in Soweto, in the same small-red brick house where, 50 years before, his mother took in other people's washing. Mr Mbeki, who also visited Sisulu's family, mourned the death of a "beloved friend and statesman of liberation". 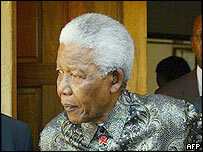 "He was a massive force for enlightenment and freedom and earned his place in the annals of history," Mr Mbeki added. Mr Mbeki said he had asked his cabinet to hold a state funeral to honour Sisulu - who would have been 91 this month. 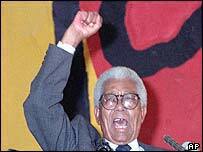 The son of a white foreman who came to his native village in the Transkei to supervise black road workers, Mr Sisulu went to Johannesburg at the age of 15 to earn money for his family. He had little formal education and worked as a kitchen, assistant, a baker and a miner. After his release from prison, Sisulu became the ANC's deputy president. He campaigned in the first truly multi-racial elections in South Africa in 1994 and saw his dream of black majority rule fulfilled - retiring shortly after the election of Mr Mandela to the presidency of the country. Mr Sisulu is survived by Albertina, his wife of 59 years. "Nelson Mandela said part of him is gone"